For a bride who feels simplicity is best! This package includes a free artist consultation of designs in the Indian/Arabic styles: with leaves, paisleys & flowers etc… It covers both sides of the hands up to the wrists and we provide after care information and advice. 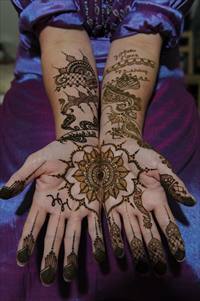 Bridal trials are available in our woodland henna studio so please contact for prices. A deposit is required to secure any bookings. Intricate artwork with shading, creating contemporary traditional designs using detailed fine lines on both sides of the hands up to the wrists and feet with optional glitter/stick on fashion accessories. Bookings include full artist consultation and after care advice. Bridal trials are available in our woodland henna studio so please contact for prices. A deposit is required to secure any bookings. 5* bridal package offers customised detailed mehndi covering entire palms and top side, extending to the elbows and both feet to ankles. It can also include an arm band piece (worked in and around jewellery) upon request. Sparkle gems or glitter to match your outfit. Plus 2 complementary hand trailing designs for 2 of your bridesmaids or guests. Artist consultation and after care advice is given at appointment. Bridal trials are available in our woodland henna studio so please contact for prices. A deposit is required to secure any bookings.